This blog post will present a set of custom controls built using the new PowerApps component feature for Canvas apps. As a prerequisite, check out Yifie Wang’s blog post introducing the PowerApps components feature and Brian Dang’s “start your journey with components” blog post that includes instructions on importing/exporting components and more. Before we delve into individual components, I would like to share 2 guiding principles we used as much as possible when building these controls. 1) A reusable control should offer a degree of customization and flexibility so that consumers of the controls do not need to delve into the component’s internal implementation in order to meet their requirements. 2) The interface of the control should remain simple and clean. By interface here, I mean the input and output parameters of the components. One has to carefully consider which input parameters are worth exposing. There is a balance between providing a flexible controls and over bloating the control with too many parameters (Interface bloat). To follow these 2 principles, we used a simple strategy where exposed only important input parameters and used a generic Styles property (a value-pair collection) to include more refined style related parameters that are useful for those who wants to further change the look and feel of the control. You can download the demo app package here and the individual components here. Special Thanks to Denise Moran for her contribution to this v1 iteration. You too can be a contributor. 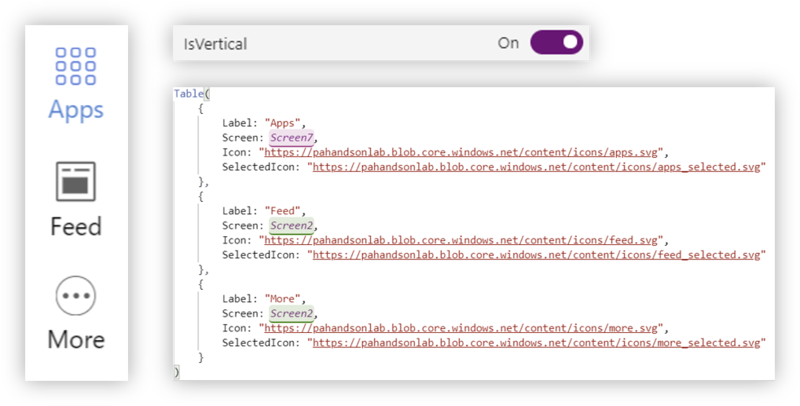 Head over to the PowerApps tools github and join the community in adding your own components. Latitude Sets the latitude of the location. Longitude Sets the longitude of the location. Zoom Zoom level of the map component. Key Required Bing Map Key to use the component. Pushpins Sets a collection of pins that is rendered within the map. Show Zoom Sets the visibility of the zooming buttons. Styles Sets a collection of styles that controls various visual aspects of the map. The Gauge Control displays a value in a certain range using a needle on a circular face. Default Sets the default % value of the Gauge. Range from 0-100. Indicator Image Url Sets the image representing the needle of the gauge. A non visual component that signals when the mobile device enters or leaves a particular area within a certain radius. This component will only be visible in the PowerApps Studio and will not render when the app is running. Given Latitude, Longitude and a radius, this control will compute given the current geo-location of the device whether we are withing the specified radius. Latitude Sets the latitude of the target location. Longitude Sets the longitude of the target location. IsWithinRadius Gets a boolean value signaling whether the distance between current location and specified location (Latitude and Longitude) is within the radius. A tab control is a flexible navigation component that can be used to build tabbed interfaces in PowerApps applications. Tabs can be configured to navigate to other screens or to trigger any action such as launching a different app or opening the browser. A tab control can be used for vertical and horizontal menus. Selected Color Sets the text color when the tab is selected. Size Sets the font size of the text. IsVertical Sets the orientation of the tab control. Styles Sets a collection of styles that controls various visual aspects of the tab control. Selected Sets the selected tab item. Dialog controls are modal UI overlays that provide contextual app information. They block interactions with the app window until being explicitly dismissed. They often request some kind of action from the user. Title Sets Title of the Dialog Box. Description Sets the body text of the dialog box. The NumericUpDown control allows users to increase or decrease a numeric value using the increment and decrement buttons. Min Sets the minimum value to which the user can set for the NumericUpDown. Max Sets the maximum value to which the user can set for the NumericUpDown. Increment Sets the increment used when user increments or decrements the NumericUpDown. BorderThickness Sets the border thickness of the NumericUpDown. BorderColor Sets the border color of the NumericUpDown. BorderRadius Sets the border radius of the NumericUpDown. ButtonsColor Sets the color of the increment and decrement buttons. Styles Sets a collection of styles that controls various visual aspects of the NumericUpDown. Increment Button Icon Sets the image for the increment button. Decrement Button Icon Sets the image for the decrement button. Value Gets Current Value of the NumericUpDown. Code Sets the text used the generate the code bar using code 39. A calendar view lets a user view and interact with a calendar that they can navigate by month or year. A user can select a single date or a range of dates. Color Sets color of the text. BorderRadius Sets the border radiaus of the selected date rectangle. Selected Date Color Sets the color of the text of the selected date. Default Start Date Sets the default start date. Default End Date Sets the default end date. StartDate The selected start date. EndDate The selected end date. This default to start date when the Select Range is set to false. 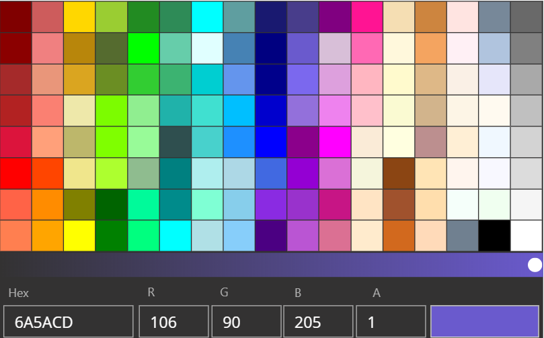 A color picker is used to browse through and select colors. By default, it lets a user navigate through colors on a color spectrum, or specify a color in either Red-Green-Blue (RGB) or Hexadecimal textboxes. SelectedColor Gets the selected Color value. SelectedHexColor Gets the selected Color value in Hex representation. A progress control provides feedback to the user that a long-running operation is underway. It can mean that the user cannot interact with the app when the progress indicator is visible, and can also indicate how long the wait time might be, depending on the indicator used. 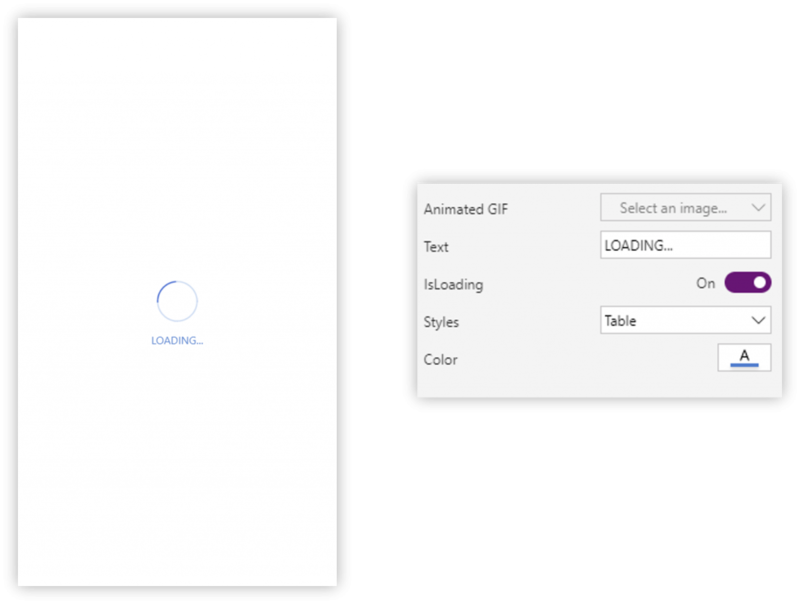 Animated Gif Sets the animated Gif for the Preloader animation. Color Sets the color of the preloader text. Styles Sets a collection of styles that controls various visual aspects of the Preloader. Give it a try ! We would love to hear your feedback. We have more open-source components coming soon to the PowerApps Tools github repository…. If you have any feedback or issues, please feel free to add to https://github.com/Microsoft/powerapps-tools/issues.